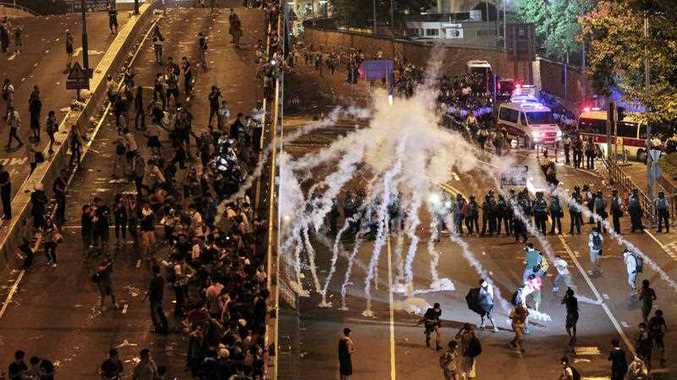 PRO-DEMOCRACY protesters in Hong Kong were reportedly met by police using tear gas and heavy force on Sunday night. While there have been reports of social media being shut down and press blackouts, even Hong Kong Government News has described the situation as "chaos". Images from the scene show tear gas being fired into tightly-packed crowds of students outside government headquarters. Protesters were demonstrating by lying down in public spaces and while reading books and by marching peacefully with empty hands held up. At least one twitter page supporting the protest is Occupy Central with Love and Peace (OCLP), whose twitter page calls themselves "a nonviolent direct action movement that demands a fully democratic government in Hong Kong." The Hong Kong government has denied claims that they will be asking for military help from the mainland.